Lafeber Nutri Berries Original The small pack of the popular Nutri-Berries by Lafeber, the ideal treat. Nutritious & natural crunchy beads, coated with vitamins and minerals. Each bead contains 40 essential food nutrients – recommended by Dr. TJ Lafeber. The snacks contains: Corn, safflower oil, nuts & seeds content: 1.47 Kg (100gr. = 2.90) EXPERT TIP: Also try the three different flavor varieties by Lafeber. 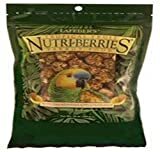 Lafeber Nutri-Berries Original Complete Parrot Food 340gr. This entry was posted in Birds and tagged 284g, FRUIT, Lafeber, NutriBerries, Parrots, Tropical by One Boutique. Bookmark the permalink.